Phenoxyethanols are a simple aromatic primary alcohol variety. These ethylene-based phenol ethers and are commercially produced when ethylene oxide reacts with Phenol. Phenoxyethanol is present in rose oil and green tea. It (also known as rose ether) imparts a rose aroma to the end-product. Hence, phenoxyethanol is chiefly used in perfumes and deodorants in the personal care industry. Furthermore, it possesses antibacterial properties, thus making it ideal for usage in the preservation of cosmetics, ointments, detergents, and cleaners. Phenoxyethanol is largely used as a fragrance component and preservative in several rinse-off and leave-on cosmetic products such as lip and eye make-up, water-based skin lotions, perfumes and deodorants, and nail polish removers. Phenoxyethanol also boasts a broad spectrum of antimicrobial property. Thus, it is widely used in the pharmaceutical industry. Furthermore, phenoxyethanol is used as dye solubilizer and dye carrier in dyes and inks applications. It can also blend with parabens efficiently. This makes it an ideal constituent for preserving cosmetic products. Currently, demand for blends of phenoxyethanol with other preservative compounds is rising significantly. Transparency Market Research suggests that the global phenoxyethanol market will expand at a CAGR of 4.9% between 2017 and 2025, rising from a valuation of US$170.3 mn in 2016 to US$260.3 mn by 2025. On the basis of application, the home care segment is anticipated to remain attractive during the forecast period due to the increase in demand for phenoxyethanol in the detergent and home-cleaning fluid applications. Phenoxyethanol is utilized in architectural and industrial coatings. It is utilized in several architectural and industrial coatings, as it acts as a solvent. Phenoxyethanol P5 is employed as a coalescent in water-based architectural and industrial coatings. The usage of phenoxyethanol in these coatings improves the appearance and the durability of the coatings. In 2017, the homecare segment accounted for over 18% of the overall phenoxyethanol market and is expected to go on to account for a larger share in the global market by the end of the report’s forecast period. Usage of phenoxyethanol as an additive in paints is also expected to account for a significant share in the global market by the end of the report’s forecast period, taking up the second spot in terms of share in the global market. Of all the key regional markets, the phenoxyethanol industry remains the largest in Asia Pacific, chiefly owing to the dominance of China. The high rate of urbanization encountered in Asia Pacific as well as an increasing awareness about sustainability will drive phenoxyethanol future demand. 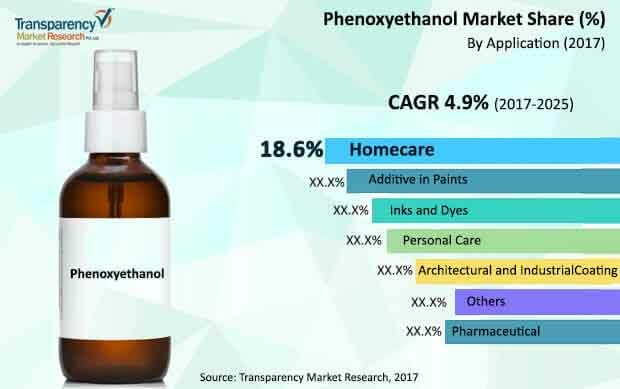 Most demand for phenoxyethanol comes from home care applications in Asia Pacific, although there is also demand from paints, pharmaceuticals, and inks and dyes among other applications as well. In terms of consumption, China again leads the phenoxyethanol market as it has a large number of manufacturers of home care and cosmetic products. Hence, it can be noted that the country has substantial captive consumption of phenoxyethanol. ASEAN Countries and Japan have a significant demand for phenoxyethanol as these countries show strong demand from home care and the personal care products. Europe and North America also show promising demand for phenoxyethanol. Key players in the phenoxyethanol market include The Dow Chemical Company, BASF SE, Lonza, Procter & Gamble Co. (P&G), Clariant, Ashland Inc., Galaxy Surfactants Ltd., Akema Fine Chemicals, Finetech Industry Limited, and Penta Manufacturing Company, LLC.